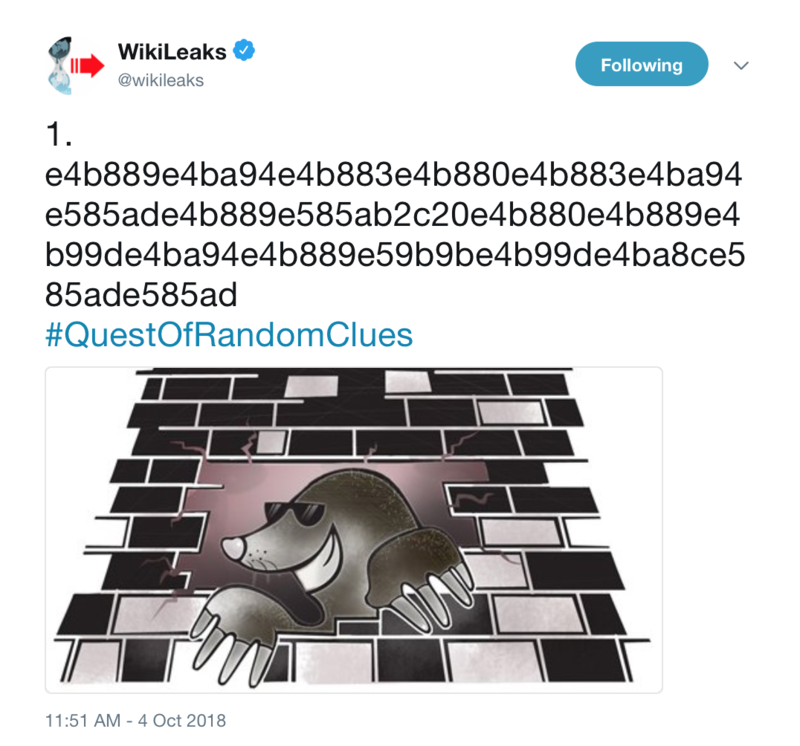 October 4, 2018, marked WikiLeaks’ twelve-year anniversary and to celebrate the occasion they posted a “Quest of Random Clues” for its followers on Twitter. I’m not sure if we’re seeing another publicity move for an upcoming publication but just in case I figured I would start covering it like I did Vault 7. I didn’t check to see if that’s correct so here’s the website if you guys want to check it out yourselves. I always think it’s important to look at what WikiLeaks (and very often other accounts) posted before or after clues so looking at October 4, 2018, they tweeted about their latest publication, “Dealmaker: Al Yousef,” a secret document about a billion dollar arms deal between French company GIAT Industries SA (renamed Nexter Systems) and the United Arab Emirates here and here. For a link to Dutch military slides about the alleged GRU attack go here. “China is a resolute defender of cybersecurity. It advocates for the international community to work together on tackling cybersecurity threats through dialogue on the basis of mutual respect, equality and mutual benefit. So, I’d say for day one we’ve got ourselves the subject matter: Spying, hacking, and Vault 7. But let’s back up for a moment. The reason anyone is talking about Shannon airport in Ireland is because WikiLeaks clue, “2u55fq73azn2lhzm.onion,” is a photo of Shannon Airport’s Terminal 2. Truthout.org‘ called it, “Ireland’s Gateway to Torture” and all you have to do is google this stuff to see that Shannon really does work hand in hand with the U.S. government — more particularly with the CIA. So, could this be what WikiLeaks is eluding to? A rendition plane marked for Julian Assange has landed at Shannon? WikiLeaks put out a second clue today and I totally feel like this is something really easy that we all learned in second grade math about patterns but, yeah. No idea. However, @greekemmy Google image searched the clue and apparently “Ted Cruz presidential campaign, 2016” showed up. Wut? When I googled it, I got meetcircle.com, an online service that helps manage parental controls and internet filtering (boooring, I think? ), and circle.com, a crypto finance company. …and then somebody else mentioned more hex codes when it came to the colors. So we have so far (maybe) clues that link to a Tokyo data center, spying, hacking, the Shannon airport, Ted Cruz, and the colors of shapes. Besides Cruz having an Irish-Italian mother, I’m lost. …with a link to M.I.A.’s “Paper Planes.” You might remember that Julian Assange posted the same video and code back on December 31, 2017. I don’t believe that anyone has figured out what the code means so if you have any ideas, post them on Twitter. UPDATE: Check out @ChateauRuby’s tweet — she posted a video showing that the circles and stars are definitely colored.